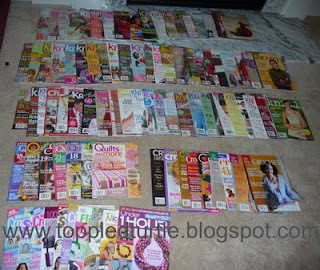 That's a whole lot of knitting, crocheting, quilting, and other crafting magazines for....free! I've seen fabric, yarn, scrapbooking supplies, etc posted up for free. I've gotten countless toys, clothes, and other miscellaneous items from freecycle. And, I've given away lots of stuff that we would have otherwise thrown away or hauled over for donation. Here's the nitty gritty: I get a lot of emails everyday and I have to weed through them to find what interests me. Most days, its nothing. Some days, there are lots of goodies I'm interested in. My local freecycle uses yahoo groups and members post their free wares for those interested. You can get emails one by one or once or twice a day. I've tried both methods and have found that the once or twice per day option is useless. By the time I read through all of the posts, most of the items have already been taken. You have to check your email several times a day and respond immediately when you'd like something. The great thing about the way my local freecycle group runs is that each post states the item and nearby location/intersection in the subject of the post, so weeding through all the posts goes very quickly. Its not all perfect. One big downside is the number of posts by people trying to get rid of items that are basically useless/used beyond repair. The very first item we picked up was a bike trailer that was purported to need "a little TLC"...turned out there was no tow bar, the tires were rusted on, and the parts were no longer available for that model. We learned a lesson from that first attempt...be weary of "needs TLC" or "needs repair/work" posts. But, once you get the hang of it, and you get your hoarding tendencies in check, its a great way to supply your craft and toy closets and to pick up some random items you've been considering purchasing. I highly encourage you to check it out at least...perhaps sign up for a short time to give it a try. I absolutely love the idea of passing along perfectly usable items to people who could get some use out of them and thereby keeping items out of a landfill, as well as getting some great things for free. The more people who freecycle, the more great items there'll be to pick up! Now that I've got a lot of reading to do, its time to pull out the post-its and mark patterns I'd like to try. Enjoy your freecycling!